I hope all of you guys enjoyed your Easter Weekend! G&G Shimmer series will make your eyes glow like a jewel, and let it shine! As well as enlarging your eyes, it's streaky glittery print will allow your eyes to get the little sparkle! They come in Gray, Hazel and Yellow! You can get it for $14.34 USD!! Second series is G&G Tulip Series! It has nice flower prints, which will make your eyes stands out from everyone else! This is normally $23.99 USD, but with Easter promotion, you can get 40% off, which makes it $14.34 USD! Last but not least, it's Princess Pinky Radiance series! This is new series after the Princess Pinky Eclipse series! This will give the sparkle and life to your eyes, which will brighten up like a nice spring sunshine. They are on sale for $17.34 USD, until 4/24/2014. 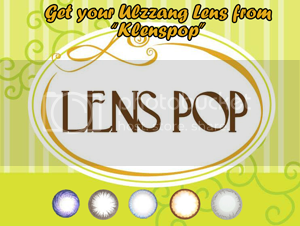 If you are looking for a lens that will give you amazing color and nice enlargement, grab your pairs today! Also for those people who purchase above $60 USD, you will get a free Easter inspired Travelling Kit! They come in cute egg designs! to get a mystery gift! !